Mushrooms have been prepared by humans for thousands of years. They have a broad range of health benefits and taste great. In particular, sauteed mushrooms are one of the most incredible tasting foods, but that’s providing you know how to saute. This article takes a look at how to saute mushrooms for the best taste, along with some great recipes. Which Kind of Sauteed Mushrooms Are Best? While most of us often stick with white button mushrooms, there are hundreds of mushroom varieties out there. Some of these mushrooms are unbelievably flavorful and low in moisture. On the other hand, some mushrooms have a mild flavor and a higher water content. For the tastiest sauteing, we want mushrooms high in flavor but with the least water. Cremini mushrooms are deliciously flavorful and taste great. While they look similar to white button mushrooms in shape, their taste is much more intense. 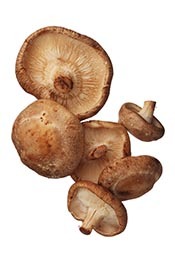 Cremini mushrooms are very rich, a little meaty and also have a mild nutty flavor. Usually thought of as a mushroom for breakfast, or a stuffed mushroom, portobello mushrooms are also ideal for sauteing. 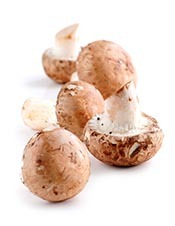 Compared to white mushrooms, they contain less moisture and therefore have a richer taste and texture. Similar to cremini mushrooms, they also have a somewhat meaty taste. 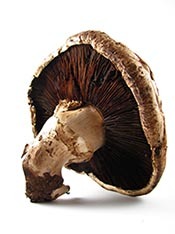 These are my absolute favorite mushroom and they have such a deep, intense flavor. The texture is spongy and chewy, and the taste is meaty, so it’s almost like you’re eating (very soft) meat. Shiitake mushrooms are also a bit drier than most, which makes them an excellent choice for sauteing. If you have never tried shiitake mushrooms, then you should give them a go. Key Point: For the best sauteed mushrooms, choose brown varieties rather than white. More flavor but also less water makes them the perfect choice. To saute mushrooms, the first thing to do is give them a clean. Mushrooms are often dirty and need cleaning and washing. However, do not soak them; soaking mushrooms allows them to absorb water similar to how a sponge would. We want the smallest amount of moisture possible, because if the mushrooms release too much water, they won’t be sauteing. Instead, the mushrooms will boil/steam in their own liquid. Although soaking is not a good idea, there’s no problem with a little rinse. So rinse the mushrooms, clean off any visible dirt, and then pat them dry ready for cooking. Key Point: Wash the mushrooms, but don’t soak them. Knowing how to cook mushrooms is about being aware of the moisture they contain. If we saute them on a medium heat level, the mushrooms will release water into the pan and begin to boil/steam. The result of this is a soggy mess, with the cooked mushrooms full of water. In contrast, we want some golden-brown mushrooms, slightly crispy on the outside and soft in the middle. So, high heat cooking is imperative as it doesn’t allow the water chance to build up in the pan. Whenever we cook oil or fat at a high heat, we should be careful to choose fats that are suitable for higher heat cooking. In other words; we definitely shouldn’t be using omega-6 vegetable oils. Out of these choices, I’d recommend ghee as the best option if you have it handy. Otherwise, anything else is also great. Just to point out that while coconut oil is perfectly suitable for high heat cooking, I don’t think it gives the best taste for sauteed mushrooms. 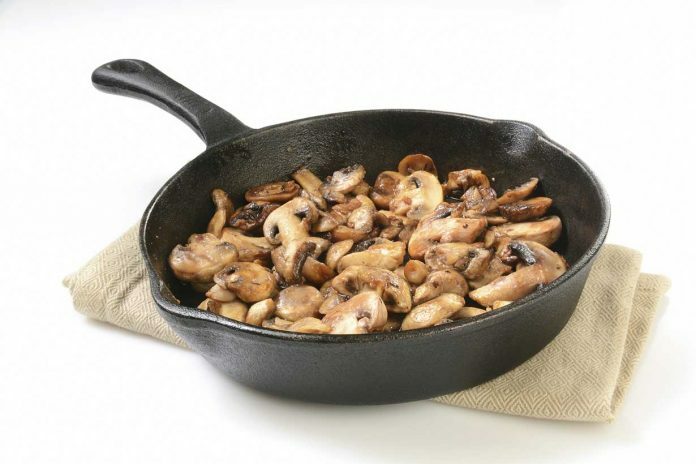 Key Point: Sauteed mushrooms require a high temperature, so choose a suitable cooking fat. As previously mentioned, we need to cook at a high heat so get the pan hot before adding your fat of choice (I’ll presume it’s butter). Next, wait until the butter is visibly hot and then add the mushrooms to the pan. It’s especially important not to add too many mushrooms, as each one should have contact with the bottom of the pan. To put it differently, don’t crowd the pan. If the pan is hot enough, after adding the mushrooms they should start spitting and sizzling. Keep stirring them at regular intervals to make sure they don’t stick, browning them on both sides. As you are cooking, if the food becomes too hot and begins to smoke then turn the temperature down a little. Note: if a small amount of liquid comes into the pan, don’t worry about it. Just keep stirring until it evaporates. Finally, after about 5 minutes when the mushrooms are almost evenly browned, it’s time to add some seasonings. After seasoning the mushrooms, cook for about one more minute and then remove the pan from the heat. Key Point: The best way to saute mushrooms is to stir regularly on high heat, evenly brown them and season towards the end. In no particular order, here are ten amazing looking dishes featuring sauteed mushrooms. If any of them look good to you, then just click the button to see the recipe and instructions. A great nutritious recipe featured on The Mushroom Channel; the ingredient profile is both healthy and very tasty. With garlic, ginger, butter and cheese included in the recipe, these mushrooms are full of flavor. Claiming to be as good as — if not better than — steakhouse mushrooms, this recipe is also full of incredibly tasty ingredients. With strong flavors coming from the white wine, dried onion, and garlic, these mushrooms are delicious. Here’s another steakhouse style recipe, but this time with the addition of shallots, olive oil, and thyme. So, a similar style but completely different (also delicious) taste. Here’s another recipe with ingredients that almost guarantee an amazing taste. Compared to the other recipes, this one needs a little more preparation time, but the extra ingredients all add to the flavor. A little different from the previous recipes, these mushrooms come in a creamy, cheesy garlic sauce. You can either eat them with meat or fish, and they also make a great tasting dish just on their own. Given the short preparation time (5 min prep, 5 min cook), this recipe is incredibly simple. While it’s very easy, it’s also full of nutrient-dense tasty food. As a result, this recipe is a great side-dish that is ready in no time. If you’re like me and love anything with cheese, then this recipe will be perfect for you. As a result of the combination of Parmesan cheese, butter, olive oil, and garlic, there’s so much flavor in this dish. Not only does this recipe have cheese, but also chicken broth, butter, and balsamic vinegar. Additionally, there are also some dried herbs to add even more to the taste. In other words, this recipe is sure to be delicious. Note: if you want to avoid the grains in store-bought polenta, it’s easy to make your own. Here is another simple recipe that requires minimal preparation time, but it’s also full of flavorful ingredients. With a trio of butter, garlic, and olive oil, it’s hard for it to taste anything else but amazing. Last but not least, here’s a unique recipe from Natasha’s Kitchen that also includes lemon and parsley. Coupled with other great tasting ingredients like butter and garlic, these are sure to taste great. Key Point: Ten tasty sauteed mushroom recipes; while they’re all a little different, they’re all equally delicious. If you didn’t already, hopefully, you know a little more about how to saute mushrooms now. Cooking mushrooms this way lets you get that delicious steakhouse style. Bronzed mushrooms at home – whenever you want! If you have your own sauteed mushrooms recipe, feel free to share it in the comments below.